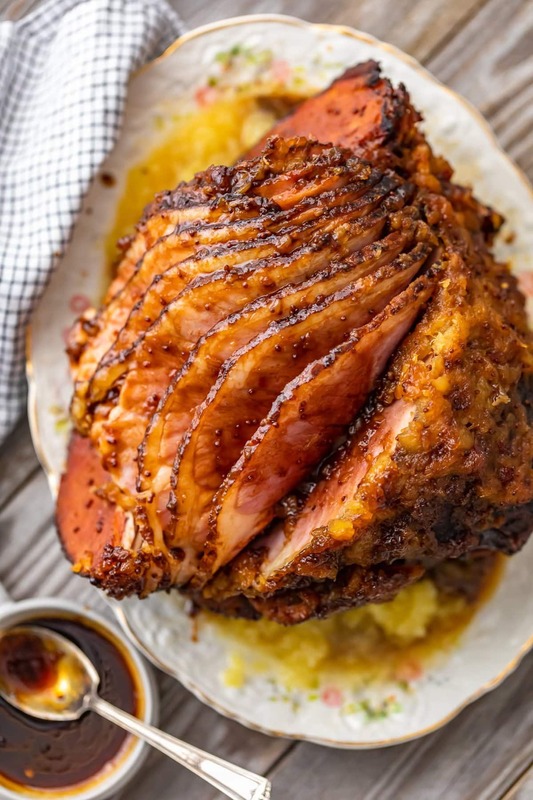 This Brown Sugar Pineapple Ham is the perfect Easter Ham recipe! We made a delicious cola and brown sugar glaze for ham, and combined it with crushed pineapples. 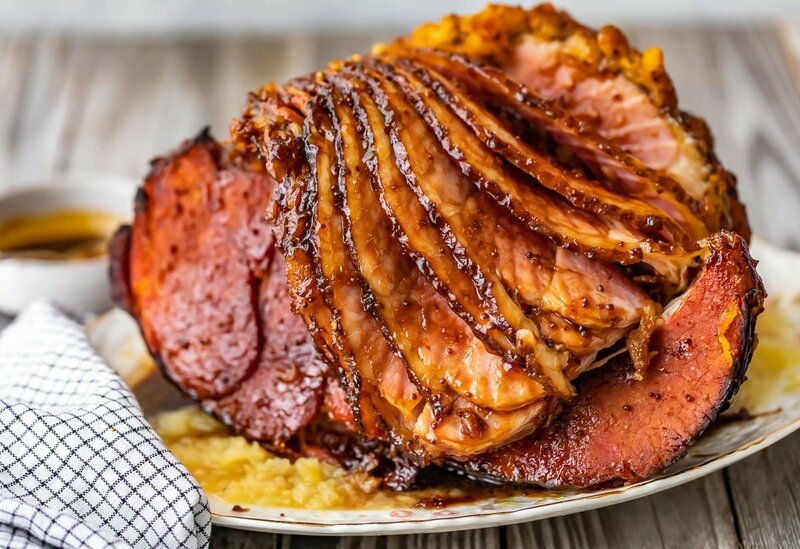 This spiral ham is easy to make, and filled with SO much flavor! 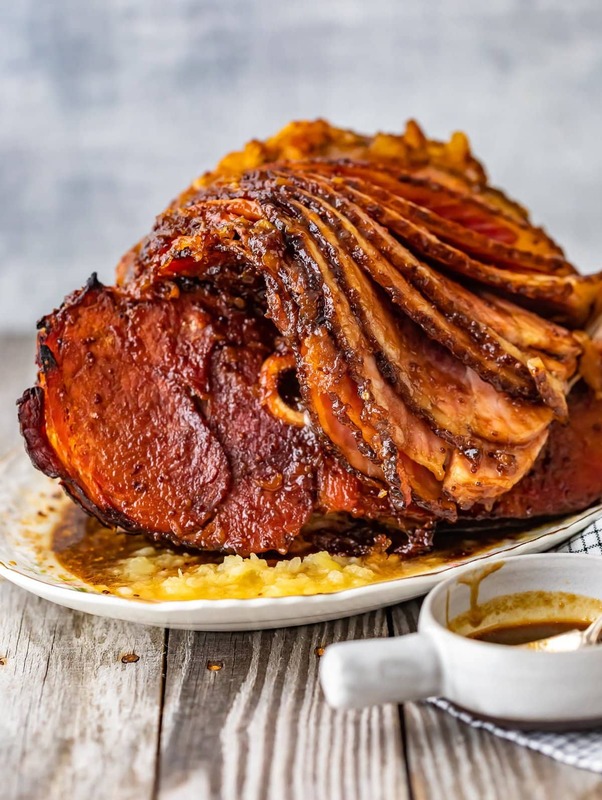 This Brown Sugar Pineapple Ham recipe is perfect for Easter or any other holiday. The brown sugar cola ham glaze is just delicious! Nothing says EASTER like a good Easter Ham recipe. This Brown Sugar Pineapple Ham is just perfect for the holiday because it’s super tasty and super easy! This is the best spiral ham recipe out there. Simple, delicious, and something everyone will love. 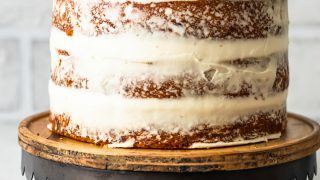 The glaze is a mix of cola, brown sugar, and pineapple, so it’s got plenty of flavor. It will look so beautiful at the center of the table, surrounded by whatever side dishes you decide to serve. 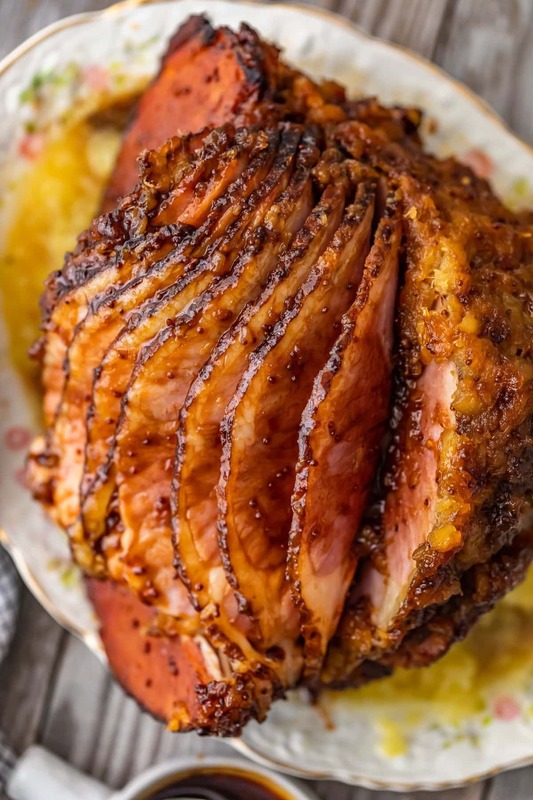 This Pineapple Brown Sugar Ham is the PERFECT holiday or Easter ham! 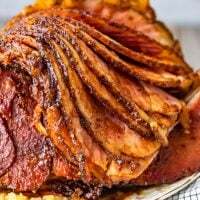 This spiral ham makes holidays easy, and with this amazing cola, brown sugar, and pineapple ham glaze, this just might be the BEST spiral ham recipe. Especially for Easter and other holidays! Spiral-cut hams were made for convenience. It can be pretty difficult to cut bone-in hams, and most of us don’t want to deal with that at the holiday table. A spiral ham is cut (before you buy it) in a spiral shape around the bone. This leaves the meat on the bone, but makes it really easy to slice the ham when you’re ready to serve it. Genius! How long do you cook a spiral ham? As with any meat, how long to cook a spiral ham depends on the size of the ham and your oven. It will vary slightly, but a good rule of thumb is about 10-15 minutes per pound of meat. However, simply following our recipe, you will get a perfectly cooked ham! You’ll be checking the internal temperature every 10 minutes as you baste and glaze, so this time will vary. But we just want to make sure we get to an internal temperature that is safe to consume (140°F) while continuously glazing to keep it moist. 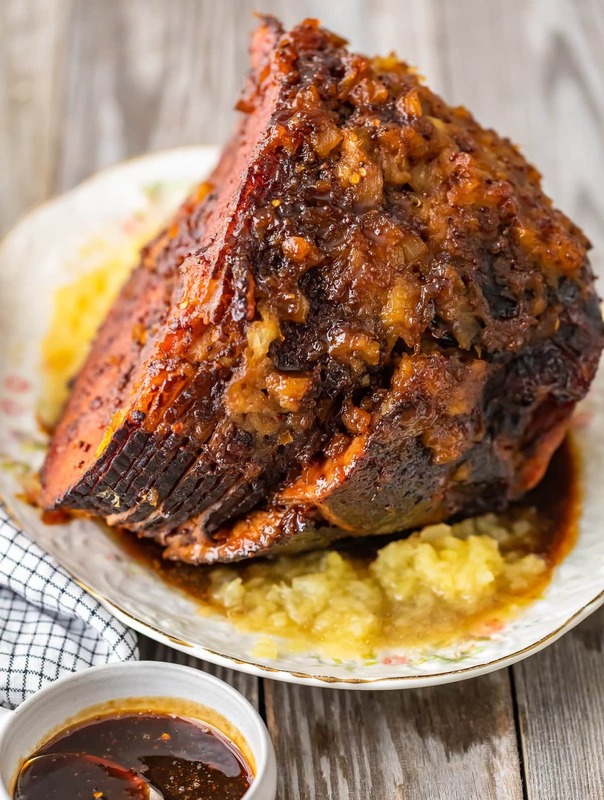 The pineapple, brown sugar and coca cola ham glaze is what gives this recipe all of its flavor! It’s an interesting mix of ingredients that combine to create one TASTY glaze. We start with the cola and brown sugar ham glaze, made on the stove top. That gets poured allll over the ham, and then we add in the crushed pineapple separately, but it all mixes together as the ham bakes in the oven. We use this same glaze to baste as it bakes, so more and more flavor and moisture gets added in throughout the whole process. 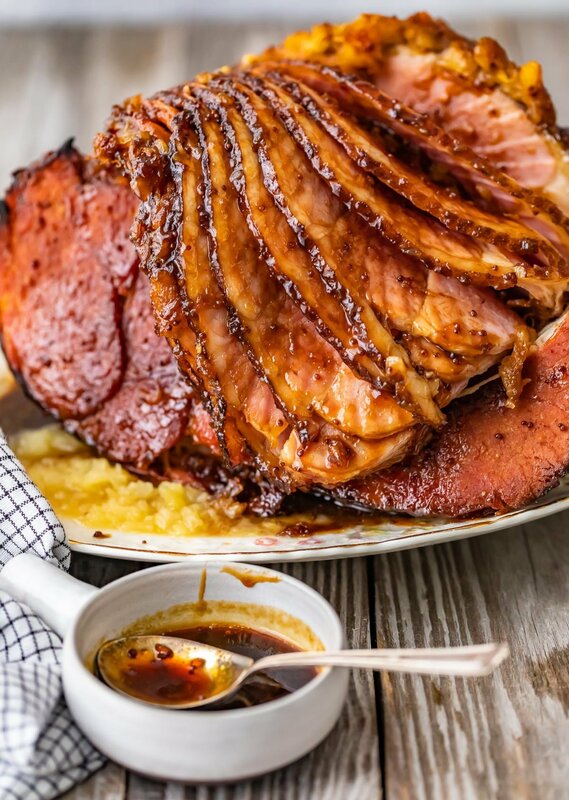 This brown sugar pineapple ham glaze is super easy to make. You can make it on the stove while the ham goes through the initial baking process, so it’s ready to glaze when the ham comes out. Bring to a boil over medium heat, then reduce heat to a simmer. Let it simmer for 20-30 minutes, stirring often. When it reaches a syrupy consistency, remove it from heat and set it aside until ready to use. This brown sugar and pineapple ham recipe is hassle free! The glaze is easy to make, and the ham just needs a bit of basting and some time in the oven. Start by scoring the ham. Use a sharp knife to make 1/2-inch deep cuts about 1 inch apart. Cover the ham and bake at 325°F for 1 hour. While the ham is in the oven, make the glaze. Take the ham out of the oven, and brush half of the glaze over the ham and down into the slices. Then spread the crushed pineapple over it, and then about half of the remaining glaze over the surface. Bake the ham uncovered for 15 minutes. Now you’ll want to continue glazing the ham as it cooks, about every 10 minutes. You’ll need to keep cooking until the internal temperature reaches 140°F, so check every 10 minutes to make sure you don’t over cook it. Check the recipe card below for full detailed instructions! 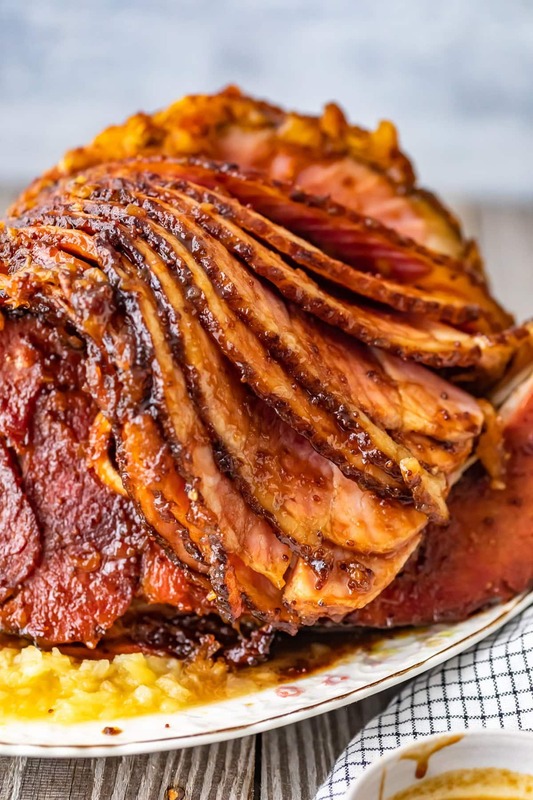 This brown sugar and pineapple spiral ham is the perfect Easter Ham! It’s so easy to make and takes all the stress out of a holiday meal. This just makes a great holiday ham in general. Try it for Thanksgiving or Christmas too! If you are making it for Easter Dinner, try it with some of our favorite Easter recipes! 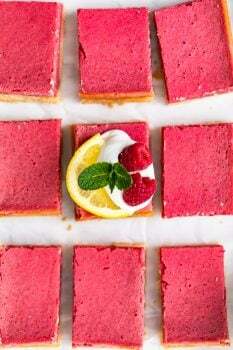 These recipes are all so fun for Easter Sunday! 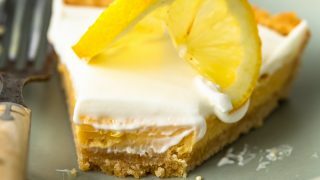 Easy lemon pie with sour cream topping and saltine cracker crust. 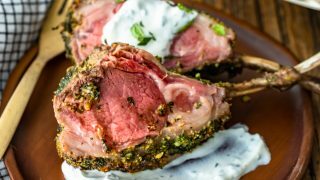 Beautiful rack of lamb with an herb crust and mint yogurt sauce. 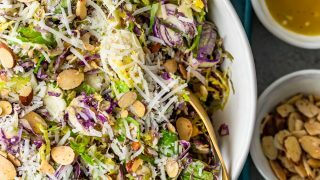 Easter salad with shaved brussels sprouts, almonds, and honey dijon vinaigrette. Classic Hummingbird Cake with Dried Pineapple flowers on top. 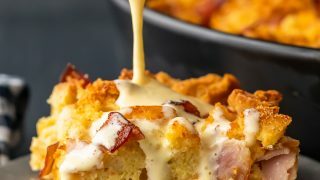 Easy eggs benedict casserole is PERFECT for Easter brunch. 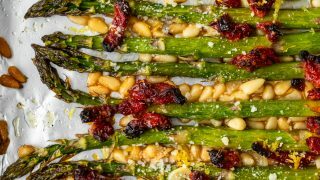 Delicious roasted asparagus is a great side dish! Whether you make this as your Easter Ham this holiday, or for another occasion, I hope you enjoy it as much as we do. 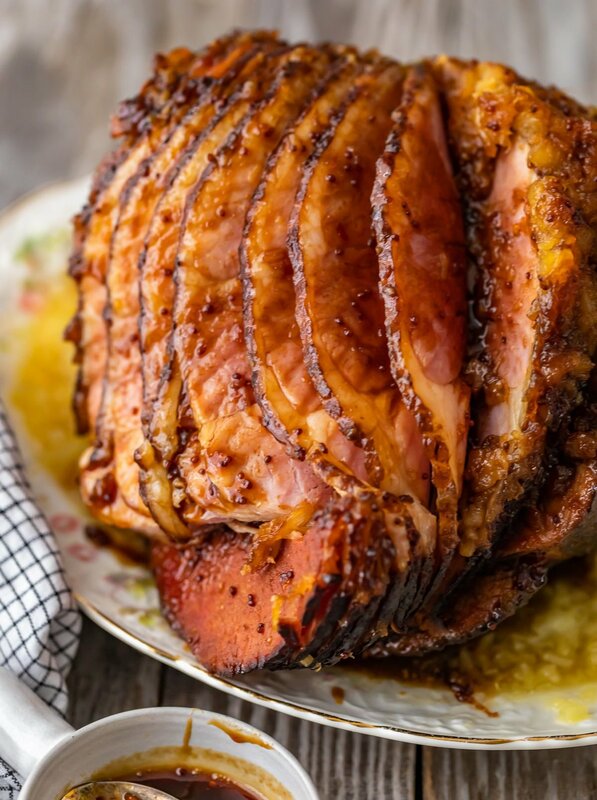 This brown sugar pineapple ham is just delicious, and I can’t for you to try it! See the recipe card for details on how to make Brown Sugar Pineapple Ham. enjoy! Combine all glaze ingredients in a medium-sized saucepan. Bring to a boil over medium heat, reduce heat to a simmer and cook, stirring often, 20-30 minutes, or until glaze is the consistency of syrup. Remove from heat and set aside. Use a sharp knife to score the surface of the ham with 1/2-inch-deep slices spaced 1-inch apart. Cover and bake 1 hour. Continue cooking and glazing/basting the ham (once you have run out of glaze, just baste with the glaze from the bottom of the pan) every 10 minutes until the internal temperature registers 140° on an instant-read thermometer. This could take a total 40-60 minutes. I look forward to trying this recipe! Ham is my favorite part of Easter dinner (and brunch ha!). Pineapple and brown sugar is always how my grandma used to make Easter ham! Can’t wait to make this and eat it again! It’s such a classic. Enjoy! This is seriously the best ham for Easter! I absolutely love it! It’s soo good! Thank you, Allyson. Pineapple and ham are just meant to be! Love how easy this is for a big meal! It’s perfect for the holidays! Quite possibly my favorite ham recipe. Turned out perfect! That’s so great to hear! It’s one of my favorites too. This dish looks so great! Thank you for sharing the recipe, I can’t wait to try it. It’s delicious! You’ll love it.